Cleaning your home’s air filter is one of the easiest and most important steps you can take to protect your heating and cooling system. Without an air filter, dust can adhere to the working unit. Dirty units can result in anything from inefficiency to fire, so don’t overlook this simple maintenance! Your home’s air filter is usually found behind a vent, called a return. A flat wall cold air return is normally near or on the ceiling. A baseboard cold air return can be flat or slanted and is typically located at or near floor level. Your home may have more than one return, so be sure to clean them all. Some air filters are made to be cleaned, while others are disposable and should be replaced. If you are unsure which type you have, a quick internet search for the brand will clue you in; however, it’s safe to assume that filters with cardboard frames are not meant to be reused. Use a ladder or stool to reach your air return if necessary. Open the vent. Usually there is a screw to remove or a simple latch that just requires a flip to the opposite position. Take the filter outside for cleaning if possible, as this can get messy! Use the brush to remove caked-on dust and debris. Next, turn the vacuum on and use the hose to suction remaining loose material from the filter. Once the loose dirt has been removed, turn the filter over and let water run through the filter in the opposite direction of air flow. A spray nozzle on a hose works well for this. It’s best to use a low pressure spray for this type of project. Allow to air dry completely before reinstalling. If you are unsure as to the size air filter that you need, remove the old filter first. There are sizes printed on the frame of each filter. If the filter is missing or illegible, use a tape measure to determine the length, width, and depth of the opening. If the dimensions are 14”x24”x1”, then you’ll need a 14x24x1 filter. (For help determining the best type of filter for your home, your local hardware or home improvement store will be able to offer assistance.) Once you have a new filter, here’s how to replace it. Set up a ladder or stool to reach your cold air return if necessary. Put the new filter into place, making sure that the arrows on the edge face the correct way. (Air flow moves from the room into the vent, so arrows should face away from you into the air duct). Close and latch the return. Learning exactly how long you can go between filter changes or cleanings takes a bit of trial and error. Follow these steps to determine the best time frame for your home. Set up the ladder or stool to reach your return if necessary. Open the vent and remove the old air filter. Install a new disposable filter. After one week, check the filter. Replace the filter if necessary. Wait one more week, and repeat. Continue this week-by-week process, recording each time you replace the filter. Once the excess dust has been removed from your home, the time period between changes will stabilize (for example, you have consistently needed to change it every four weeks). This is the time period needed between filter changes. 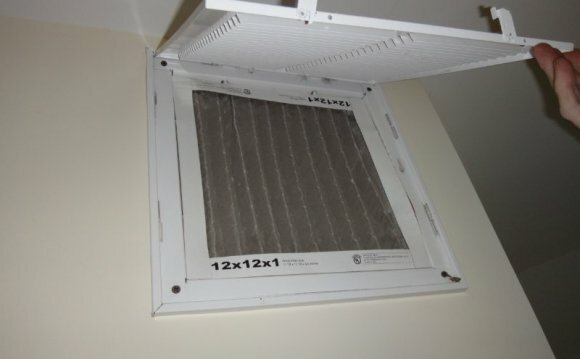 Be sure your system is off and no air is being pulled through the vent before removing the filter. Dust and debris will be freely pulled into the system, potentially damaging it, and then re-circulated throughout your home without the protection of the filter. If your home is dusty, your filter will need frequent maintenance. See section “Determining How Often to Change Home Air Filters” for more information. There are many different filter efficiency levels. Your local hardware or home improvement store will be able to assist you in determining the best one for your needs. Most home air filters need maintenance every 30-90 days.